If you’re involved in the debate over undisclosed affiliate links you really need to watch this video of Mary Engle responding to a complaint about word of mouth marketing online. Word of mouth marketing was under the radar until it was not. Hidden affiliate links are under the radar right now, but they will not be for much longer. 1. STRONG DISCLOSURE: Clearly labeling something an advertisement. Google does this by requiring you to say “Ads by Google.” I would say this is the clearest form of disclosure. 2. STANDARD DISCLOSURE OF OBVIOUS ADVERTISING (SDOA): Magazines, TV, and newspapers achieve average disclosure without labeling advertising because it’s so obvious to everyone when the ads start and end. When the editorial content is over on LOST you have a commercial come on and it’s plain as day. When you turn the page in a magazine and see a Mercedes Benz or a vodka ad you just know it’s not editorial because it is not in the same format. 3. STANDARD DISCLOSURE OF NON-OBVIOUS ADVERTISING (SDNOA): When advertising and marketing messages come in the form of non-advertising based media additional steps are called for. If a newspaper has five stories on a page and one advertisement that is formatted like the other stories–say the same font and column layout–a reader might be confused. So, newspapers put “sponsored” or “partner content” on these sections to make it clear. When a news network like CNBC carries a long-form commercial that is designed in a talk show fashion they put a warning up front that this is paid content. They put “paid programming” in the channel guide as well. You can read about magazine advertising standards here. We exist in a new medium, the web, and whenever a new medium comes out the overzealous marketers try to take advantage of the lack of standards and oversight. This leads to some form of regulation: self-imposed or governmental. Governmental is the worst kind because the Government doesn’t know your industry as well as you do, and they are historically very slow. If the government has to regulate your business you’ve failed as an industry and you’re pretty screwed because now you don’t control your destiny. Affiliate marketing is on the precipice of being regulated. We’ve been having some great examples on my post yesterday on undisclosure of affiliate links. Over at ReveNews there are some comments as well. Many other the comments are sophisticated (and many are childish, but that’s to be expected). One of the more interesting ones I think is based on commerce sites. Should commerce sites disclose they are being paid? Probably not, because it falls into “SDOA” (standard disclosure of obvious advertising). 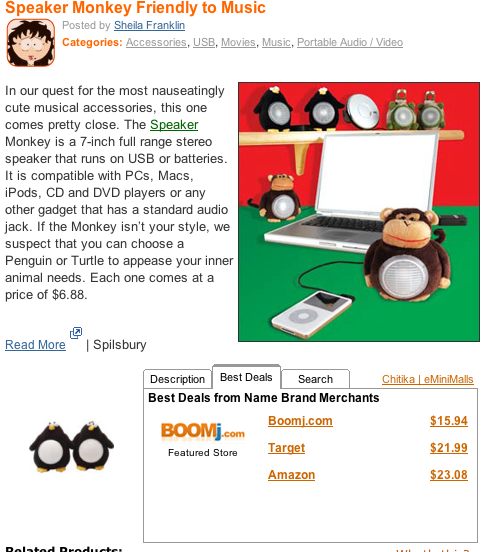 It’s clear that a commerce sites make money by selling something. So, if we walk in to Walmart we assume that they are going to make money when we buy a Diet Coke. However, when we walk into someone’s house for a dinner party we don’t expect they are making money when we drink a Diet Coke. If you site is a blog most users assume it’s like a dinner party and don’t expect you’re getting paid for handing us a Diet Coke. If your site is callled “The Diet Soda Store” and it has ecommerce elements like a shopping card and prices we all know you’re making money and no disclosure is needed. 99% of the problem in the affiliate space is because people are making non-commercial sites with hidden advertising links. Most users will be duped and you’ll get better performance than if you did disclose. A small percentage of users will find out and get upset. An even smaller percentage of those users will report you to someone (government, your partners, the press). The end result will be some combination of offenders getting caught and in trouble with the law or press, confusion in the marketplace and drive users away, or industry/partner censorship of you and your process. So, at the end of the day you’re much better off giving up performance at the start for longer value. If you’re not a pure commerce site you should disclose at the point of the advertisement. If you’re a pure commerce site it doesn’t matter because people expect you’re going to make money. Commerce sites are obviously doing commerce when they have shopping carts, the ability to buy stuff, product listings, etc. Comparison shopping links. Do these need to be labeled? I’m not sure, when I see five items listed by price at the end of a blog post or a news story I’m assuming it’s an advertisement where people get paid. Does everyone understand that? Do most folks understand that? If you look the Chitika ads on GearLive (see right) do you think they are paid or not? Partner or Offer Links: Is this clear to users? Many sites have “partner links” and I’m fairly certain those are paid when I see them (why else would they be listed as partners?). So, I know they are not just organic links, but do most folks know that “partner” means “commercial relationship” of some kind? I don’t know. I think this is a jump ball. In the About.com section (see image below) do you think that users know that “Offers” means they are getting paid? I don’t really know. Previous Post Should we ban unlabled affiliate links from Mahalo? Excluding twitter for the moment, why not use an existing paradigm to deal with affiliate links – semantically as microformats?. Something as simple as rel=”affiliate” might be sufficient. A more complex microformat might identify the advertiser or network (a la rel=”license” microformat”). This way, the small percentage of people who may be concerned can download the inevitable plugin if needed, management and links to privacy and disclosure pages automated, etc. Of course, the real drivers of this may need to the actual affiliate programs – if CJ for example put this in their auto code generation tool. As for Twitter, the major URL shorteners like BudURL could simply set up a complementary domain for affiliate/sponsored links and maintain the disclosure on their site via a link preview function. Again, it would help if Twitter then autotagged the URL. A modest proposal, at least. And requires no one else’s permission to start!